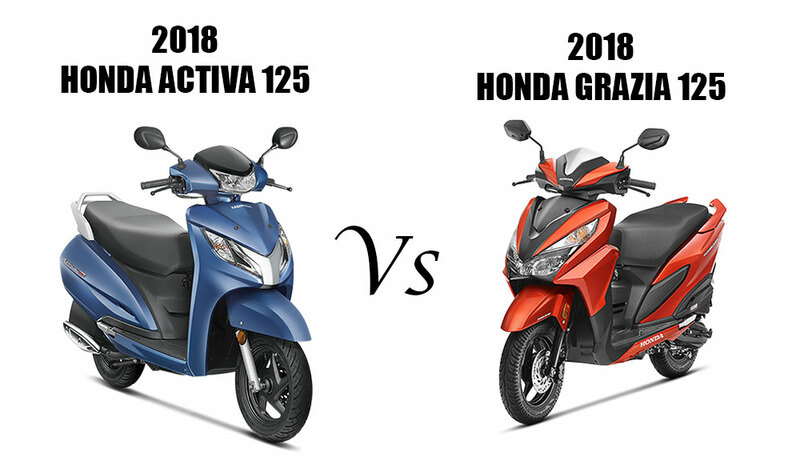 2018 Activa 125 vs Grazia 125 – Which is a better Buy? The seats of Activa 125 are large enough to accommodate the rider comfortably and even the pillion rider. The area near the front wheel of the Honda Activa 125 gets a stylish round reflector that enhances the looks and adds more safety. You also get ample space in the front to hook a bag or carry a small luggage box in the front. At a first glance, you might confuse GRAZIA for Honda Dio (a 110cc scooter from Honda 2 Wheelers). Although the overall design (chassis frame etc) is kind of identical you can clearly notice there are a lot of changes. The headlamps are positioned higher than it is in Dio. The color combinations, patterns, and front fascia although looks borrowed from Dio, the product has got its own individuality and GRAZIA is a completely different product. The GRAZIA branding glitters nicely and you can see HONDA branding across the scooter including the sides of the floor panel. You get plentiful space in the front with a large number of hooks and pockets. In terms of design, the Grazia 125 is much better looking than Activa 125. Honda Grazia is powered by Fan-cooled, 4-stroke, 125cc engine. Grazia is capable of producing a maximum net power of 8.52 bhp at 6500 rpm and offers maximum net torque of 10.52 Nm @ 5000 rpm. The transmission type is V-Matic and you can use both Self and Kickstart for the ignition system to kick in. On the road, Grazia kicks in a lot of power when needed and it feels easier and stresses less when you compare the riding experience with Honda Dio or even Activa 125. Honda Grazia offers pretty good power and torque – stability and endurance for that long ride. The fuel economy (Mileage) offered by Honda Grazia was around 45 Kmpl during our test on city roads and national highways. To be honest, Honda Grazia is a fully feature packed scooter – For the first time it brings in new features like mobile holder and mobile charging point in the front, adds multipurpose foldable hooks in the front that are handy to place your extra stuff like bags and stuff. The design team at Honda has gone one step ahead and have offered a pocket in the seat that can hold tiny stuff like documents/mobile. Adding to above, Grazia also introduces the seat opener/locker right in the front – sparing you from using the keys once again at the rear to access the under seat storage or to refuel your scooter. A simple feature but yet brilliantly done keeping the usability in mind. You also get a theft lock in the front that can be only opened through your key’s grove. Comparing the two scooter its pretty much evident that Honda Grazia 125 is an elegant looking scooter which is packed with features and more fun to ride. But since there is a good price difference between the two and Activa 125 being cheaper by 8,000 rupees and more fuel efficient, I think anyone looking out for a scooter in the 125cc segment should definitely get the Honda Activa 125 since there is nothing but positive responses for its engine performance and is much better in terms of value for money .